Photo Credit: TheKFA Facebook. What do you think Bento is saying in the team huddle? Matchday Two at the 2019 AFC Asian Cup is upon us. After grinding out a 1-0 victory against the Philippines on Monday, the Taegeuk Warriors are back in action tomorrow against the Kyrgyz Republic. Both sides will be looking to make improvements, the Kyrgyz Republic after blowing a lead against China, and Korea after struggling to break through the Philippine defense. What went wrong on Monday? Against the Philippines, it’s not that Korea played poorly. They dominated possession of the ball and played the match always pushing forward for a goal. However, the performance left a lot to be desired. First of all, players like Lee Jaesung and Kim Jinsu looked to be lacking fitness after returning from injury. This was talked about a lot in the post match press conferences and it seems that the fitness staff is still working on making sure that everyone in the team is fit. What this led to on the pitch was disjointed play, sloppy giveaways, and wasted scoring opportunities. Fortunately for the Taegeuk Warriors, the Philippines were unable to exploit this weakness, although it wasn’t for lack of trying from Javier Patiño. Later on in the tournament against a stronger opponent, this kind of performance won’t be good enough. Korea needs to put a stronger foot forward tomorrow. Not ideal is the best way to describe Korea’s current injury situation. Ki Sungyeung, our midfield maestro, sustained a minor hamstring injury and will need a week of rest. He will probably be rested until the knockout stages. Lee Jaesung also will not play tomorrow because he had a bruised toe in Monday’s match. Kim Jinsu is playing at left back because Hong Chul is recovering from an ankle injury. Kwon Kyungwon also had a minor training injury yesterday. This one is difficult to say. With the forced changes Bento needs to make due to injury, it’s hard to say exactly how he will replace Ki and Lee Jaesung. However, I have an idea of how I would do it. I can’t be sure that this is what Bento would go for. However, allow me to explain why I like this lineup as the best way to deal with the absence of Ki and Lee. Hwang Inbeom did well when coming on for Ki and it’s widely expected that he will be asked to start in Ki’s place. To partner him, I think his former Asan Mugunghwa teammate might be a better fit than Jung Wooyoung. When Ki and Jung missed the Australia friendlies, I thought that Hwang Inbeom and Ju Sejong made a really good pairing, especially in the second half against Australia. Their chemistry built at Asan will be useful and could give us a more cohesive central midfield. Hwang Heechan was more effective through the middle and it would be really interesting to see him play as a false nine behind Hwang Uijo. On Monday, the central attacking midfielder was Koo Jacheol and he didn’t have his best performance, making a lot of sloppy passes. Going forward, Hwang Heechan was dangerous all match. Lee Chungyong had an impact on the goal by playing a perfect through ball to Hwang Heechan in the box and he’s probably the best right winger to come in for Lee Jaesung. On the left, I want to see last minute addition Lee Seungwoo get his shot. There is no one more creative on the dribble than Seungwoo and he is really good at drawing defenders in so he can make space for others. Kyrgyz Republic will most likely be the weakest opponent we face in the group stage, so there is no better time to see what exactly Lee Seungwoo has to offer the side. I expect the Kyrgyz Republic to come out with a lot of desperation tomorrow. They will not want to be sitting on zero points after two matches, so they won’t sit back. However, their big weakness is at goalkeeper. Pavel Matiash had an absolute nightmare on Monday, first failing to knock the ball over his net on a corner and then getting himself stuck in no man’s land on China’s winner. Korea should look to put him under pressure on set pieces because the howler he had Monday wasn’t really even an instance where he was pressured into the mistake. He didn’t have a lot of players around him and he just bats the ball into his own net. There could be another mistake from him tomorrow if we get aggressive on corners. On the game winner, he’s slow to come out and Yu Dabao easily rounds him to score. I could certainly see Hwang Uijo, Seungwoo, Chungy or Heechan doing the same thing to him tomorrow if they’re released into space. 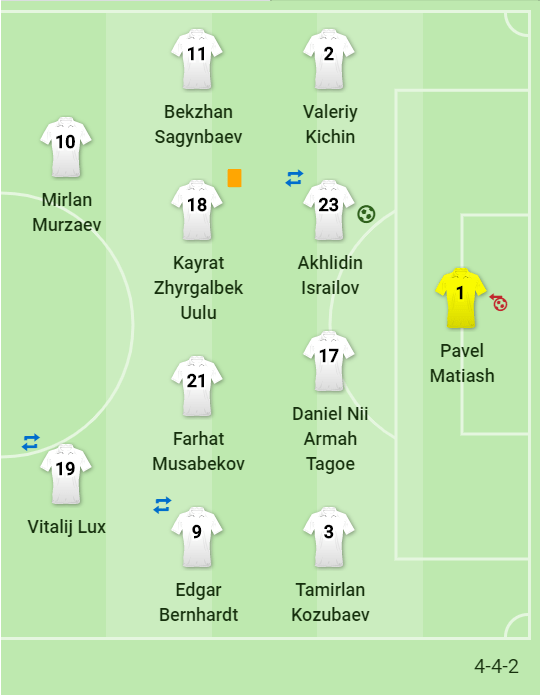 Here’s how they lined up on Monday; we’ll see if their manager Aleksandr Krestinin opts to make some changes. Looks like China didn’t have any issues dispatching the Philippines today. Lee SW will have to wait to make his debut. Koo and Jung WY in the lineup. That’s honestly a really disappointing first half. KNT should’ve scored at least 3 there. 1) I can’t remember the last time I saw such sloppy passing. Players were passing it out of bounds or directly to the opposing team. Even on successful passes, balls were always a few yards away from where they needed to be. This team is going to have to clean up these mistakes quickly because it just won’t fly against Japan, Iran, etc. Even China. 2) New rule: can the offense please stop relying on crosses from Lee Y and Hong C? The offense seems to be clicking when the ball is distributed on the ground, quick one twos, or when balls are passed over the top to players making runs. 3) Jung WY didn’t have a good half at all. I also don’t think Koo fits in this system. He seems a bit too flat footed and he should just stop shooting from 20+ yards out. Let’s see Lee SW in the match. 4) I can’t believe Lee CY missed that in front of the net. Was he worried about defenders closing in and tackling him? Just trying to understand. It was a golden opportunity. 5) Still want to see Hwang HC improve his touch and his composure. He makes a ton of lively runs and always seems to be threatening but seems to lose the ball a lot during the build up. Can’t watch game, so someone who can pls tell me: Are SK w/out Son like teams of old? Good possession %, solid enough, but can’t finish for their lives? Hearing of x bar hits, shots I’m guessing they get in consistently during practice; so is it the extra match-time adrenalin creating a bit more oomph, screwing up accuracy? aka lack of composure/not clinical? After watching first 2 games I predict that Korea will not reach even to the semifinal with that poor game. Or maybe it just economy of energy as the same way as 4 years ago?